Ronan Curtis pictured before the Republic of Ireland's recent friendly against Poland. RONAN CURTIS HAS played down the prospect of a move away from Portsmouth after the Ireland forward’s form attracted substantial interest in his services. According to reports in the UK, Curtis has caught the attention of clubs ranging from Leeds United to Leicester City. The Ireland U21 international has made a key contribution this season to a Portsmouth side who are currently sitting atop League One. Curtis, who joined the club from Derry City during the summer, has chipped in with six goals and six assists while playing predominantly as a left-sided attacker. “There are massive clubs out there but I’ve only just got here. I’ve only been here four months,” Curtis said in an interview with the i newspaper. Having been named in Martin O’Neill’s latest squad, Curtis will hope to make his senior international debut later this month. 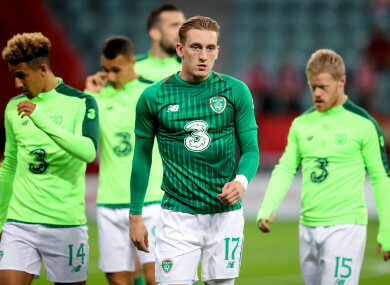 The Republic of Ireland host Northern Ireland in a friendly on 15 November before concluding their Nations League campaign away to Denmark on 19 November. Email “Curtis dismisses links to 'massive clubs' by reaffirming commitment to Portsmouth”. Feedback on “Curtis dismisses links to 'massive clubs' by reaffirming commitment to Portsmouth”.